School food gardens are one of the best ways to supplement meals for learners. The additional nutrition from fresh herbs and vegetables significantly improves a students ability to concentrate and perform better. FTFA understands that education, sensitivity, and support form the basis of sustainable food garden projects, and this is why our approach is to start small and grow big. We’ve learned through almost three decades of experience that this really is the most efficient path to real development. We have a variety of school gardening interventions, depending on the age of the school learners as well as stakeholder involvement, and a large database of worthy schools who have applied. We always recommend that most school projects start with a Permaculture Starter Pack (PSP). 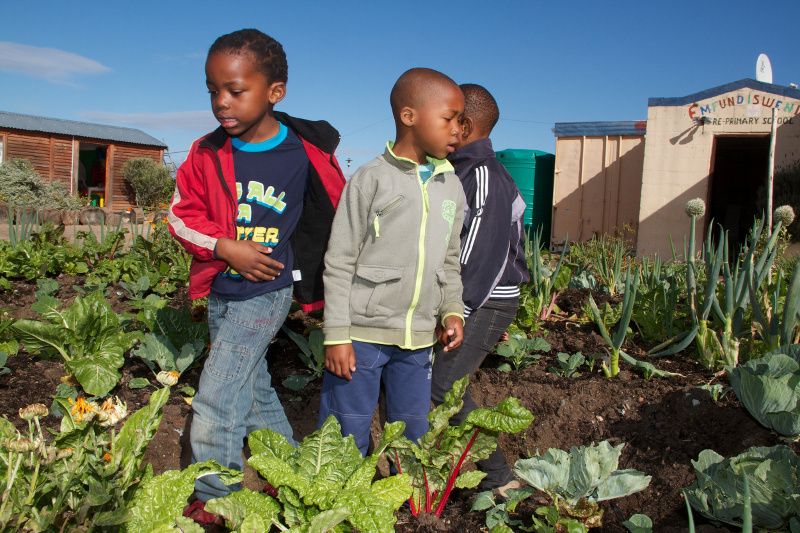 We know that school gardens play a vital role in learners’ diets. These projects also support the National School Nutrition Programme feeding scheme and improve the health of learners and their ability to study and develop. A source of ongoing teaching around respecting of the environment and taking pride in one’s school and surroundings. Learning project management through activity schedules and development plants. There are various intervention types as every food garden project is unique. At FTFA, we have developed a modular, holistic methodology to our interventions and always approach projects through a lens of planetary care, environmental awareness, and tangible sustainability. The level of participation by various stakeholders. We predominantly work with primary schools and Early Childhood Development centres (crèches). We work with high schools too but it often becomes difficult for learners in higher grades, especially Grade 11 and 12, to participate due to academic commitments. We always recommend starting a school intervention with a Permaculture Starter Pack (PSP). The PSP programme places the responsibility on the applicant who has three months from delivery to demonstrate clear outcomes and prove their commitment. FTFA believes that it is vitally important for beneficiaries to be accountable and to take ownership of a project as early on as possible. This makes it an excellent assessment tool. A PSP equips beneficiaries to either start or improve a garden, and it provides a strong foundation for sustainable development, but it rarely leads to a fully developed garden project. There are three PSP levels depending on the amount of funding available, and these levels differ in the amounts of gardening tools, seeds, seedlings, compost, educational materials, and introductory workshop days. Basic techniques and practical assistance. Educational materials (booklets, flyers, and posters) are distributed so that educators can integrate workshop outcomes into the school’s curriculum.